The announcement that Yamaha has signed Ben Spies to a contract extension through the 2012 season (see the official press release here, with some quotes from Spies and Yamaha management), comes as no surprise. 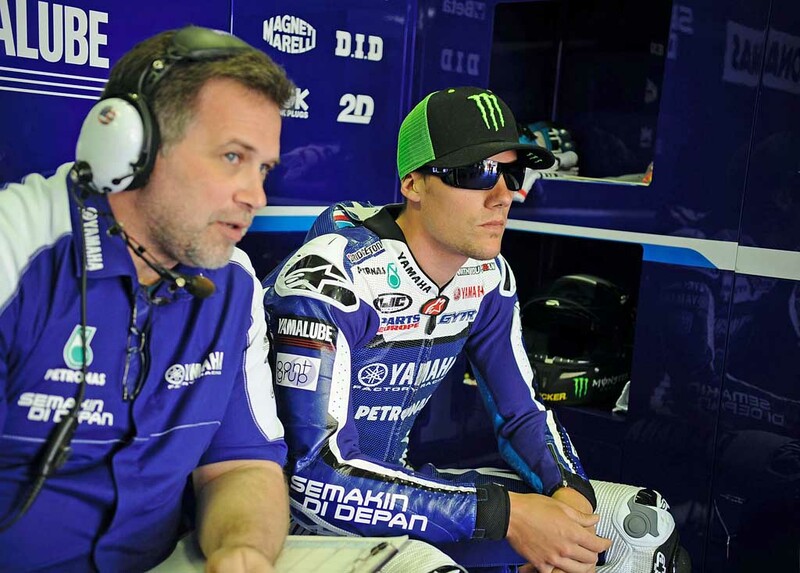 Spies has performed well for Yamaha since capturing the WSB title in 2009, and MotoGP Rookie of the Year in 2010. The transition to the 1000cc bikes next year should only make Spies more competitive. Spies has extensive experience racing 1000cc superbikes, both in the United States and at the WSB level. Although the MotoGP bikes will be substantially lighter than their WSB counterparts, the huge torque and power offered by the 1000cc machines will be familiar to Spies, and also erase any disadvantage he currently has as one of the largest, heaviest riders in MotoGP. You can follow this link to the MotoGP website for a look at the different riders currently competing in MotoGP. Spies is a big guy … nearly 6 feet tall and listed at 71 kg (156 pounds). Heavier than virtually every other MotoGP competitor except for Marco Simoncelli, Spies is arguably at a disadvantage aboard the 800cc bikes currently being raced. Indeed, Simoncelli and Valentino Rossi, another one of the larger riders (although lighter than Spies) have argued that the total bike and rider weight should be subject to a minimum, equalizing the rider/bike total weight for all participants. For comparison purposes, Dani Pedrosa is slightly more than 110 pounds, roughly 50 pounds lighter than Simoncelli. There is no question that rider weight will be less of a factor when the 1000cc machines take the grid at the start of the 2012 series. Spies, already doing quite well aboard an 800, could potentially become one of the dominant riders of the coming 1000cc era. Most teams have an “A” and a “B” rider (Honda being the exception). Yamaha would probably be most comfortable if Spies continued to be the “B” rider as their memory of the Rossi/Lorenzo days are still pretty fresh. If Spies starts winning, one of the two will probably move. I guess it’s all relative. Seems funny to me, that 156 lbs. is a “big guy”! The question isn’t Spies ability but Yamaha’s ability to equal the Horsepower of the V-4 Honda and Ducati. You’d think they’d “read the tea leaves” and dump the inline 4 in favor of a V-4. Not worried about Spies. I know he’s capable of doing pretty well, whatever the bike. Yes, the 1000s will ‘equalize’ things a bit, but what I’m worried about is Yamaha. Can they come out with a world beating bike without the likes of Rossi and Burgees spearheading it’s development? Is Masao Furusawa staying on (I heard he’s very close to mandatory retirement age in Japan). Despite the economic ramifications brought about by the quake in Japan, Honda still have considerable financial muscle over any other Japanese factory for development, and Ducati have Marlboro money plus the Rossi/Burgees dev-team now. Yamaha’s not doing the best in terms of worldwide sales, and both their factory riders, while extremely competitive, remain unproven when it comes developing a bike from scratch. There’s a big chance they might slip back to being also-rans, like the first M1 of the four-stroke era, before Rossi joined them. I’m very excited to watch Spies on a 1000. Mat Mladin should be proud of how he brutally harrassed Ben all those years on a 1000. It made Ben who he is. Ben should be competitive at the first race for sure. And Hayden, which I’m excited about as I agree people have written him off. He’s a 1000 guy too. Don’t forget Rossi who also won on a 1000. Pedrosa is only slightly more hefty than an elephant phart. No wonder he’s so fast. Very cool. I think he’s going to do much better on the big machines too – he’s a big guy, knows the torquier bikes, and that extra grunt. I think Hayden will do better as well, although a lot of people have basically dismissed him. I used to watch him race AMA (RC51s!) and the guy has passion. I wouldn’t count him out yet either from being a podium contender when the 1000CC bikes are on the grid. I’m loving this season, but next season is going to be very interesting. I suspect he will do better next year on the bigger machines. I love his work ethic and attitude. I was disappointed to read that too. Seems like a bit of a blow to the ego. Knowing you have to prove yourself every year, rather than knowing you’re wanted, being looked at as a long term investment. It seems like he’s proven his worth. Freeing up the worry that you have to prove yourself at every race frees up the mind from stress and creates a better rider. Just my thoughts, I am very happy they did extend him. If he does well next year on the 1k Yamaha will wish they’d negotiated a longer contract because his price will go up. If he does really well this year I would not be surprised if they renegotiate for a longer term and more $$. He has been a reasonably long-term investment. A year on the R1 in SBK, a year on the satellite M1 and now what will be two years on the factory bike. That’s four years. He’s at the sharp end, with no shortage of competition for his seat. His performance on the factory bike is improving, but everyone knows that bike can win. It’s either win or we’ll get someone else. It could also be that his performance will need to offset a lack of sponsorship money he brings with him. It’s more obvious in F1, but the best pure racers sometimes get passed by because the financial backing wasn’t there. Niko Hulkenberg is a prime example. The kid took a pole position, but still didn’t keep his ride.